Leif Eriksson's statue outside of Hallgrimskirkja; given as a gift by the United States in 1930 to commemorate the Icelandic Parliament's 1000 year anniversary. In the fall of 2016, I ventured to the Nordic island of Iceland. With only a week there, we limited our adventure to the southern side of the country. 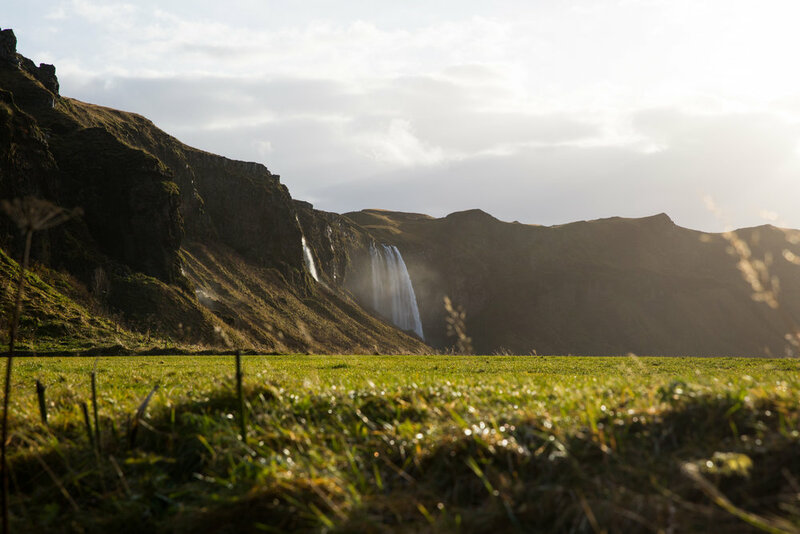 The official records say the first Icelandic settlements were founded in the year 874, when King Harald I of Norway looked to expand across the North Atlantic. Since then, the arctic nation has grown primarily in the capitol city of Reykjavik, with a total country population hovering somewhere around 323,000 total in a area near the size of Texas. The island plays host to what must surely be some of the most beautiful landscape Earth has to offer. 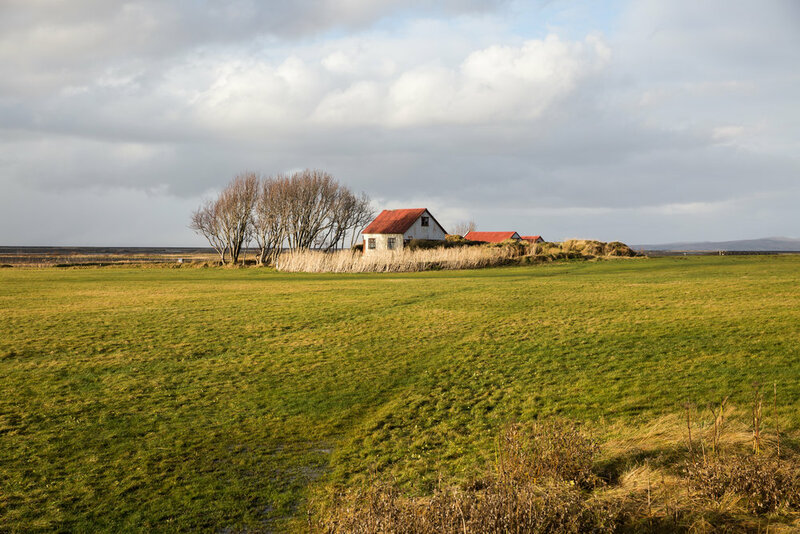 The harsh winds and weather are matched only by the gorgeous environs that range from the low altitude volcanic marshes to the windy peaks of Vesturnhorn. While another trip to Iceland is certain for me in the coming years, the south side of the island kept us more than busy. My main suggestion for those looking to travel there: if your destination is 2 hours away, give yourself at least double that time to get there, as you will be stopping repeatedly to snap photos along the way. The Ring Road is mighty, so take your time. Luckily for me, I had a sassy navigator in of my close friends, Jessica the Red. Posted below are some of my favorite locations, with a complete gallery of my top shots while in Iceland. First snow of the season sprinkled softly over the city on the morning of our road trip east. Looking to the southeast near Hveragerði, before decending into the primary stretch of the southern RIng Road. The sun shines much brighter, warming you even through your windshield. Speaking of wind, its intensity allows storms to roll in quickly and with little warning. Coupled with that and a sun that only lives in the South, the day length felt more akin to something out of The Elde Scrolls series. 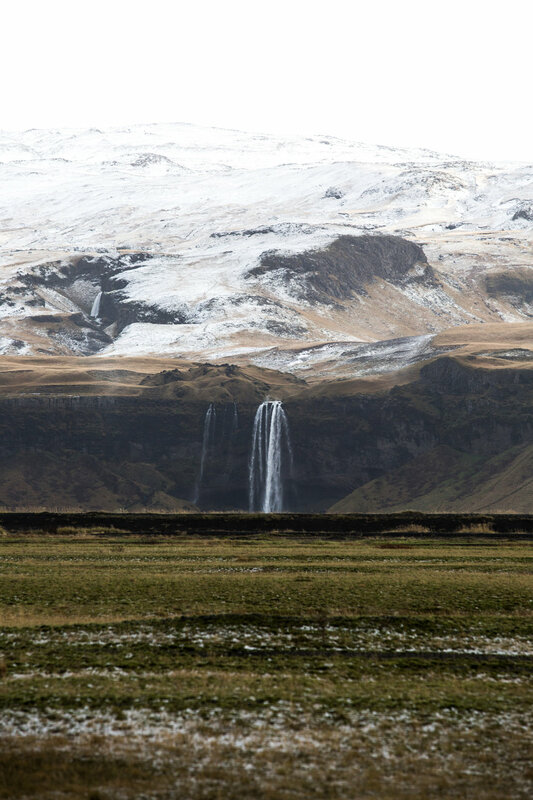 In the distance, Seljalandsfoss spills water from the glacier and rains of the day. 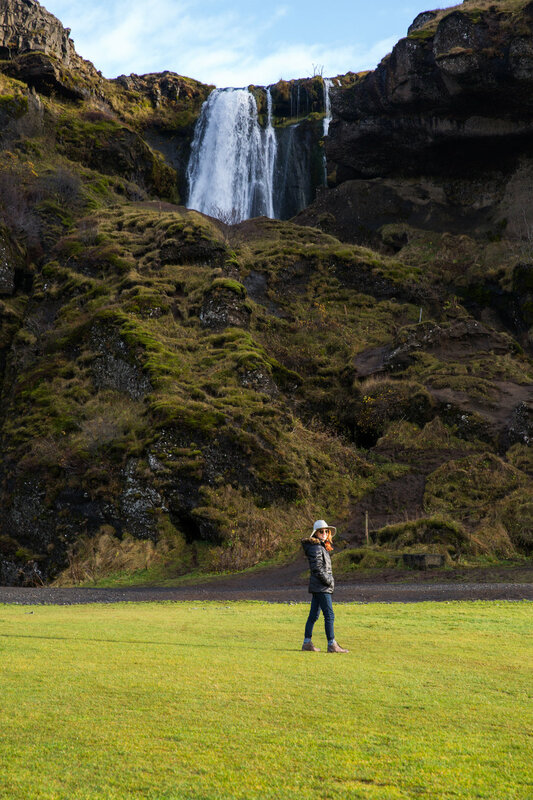 Waterfalls are everywhere here, each worth of stopping for admiration. It wasn't quite snow, but bits of hail hit us on and off in the minutes trying to frame a decent photo from afar. Giants standing among giants. 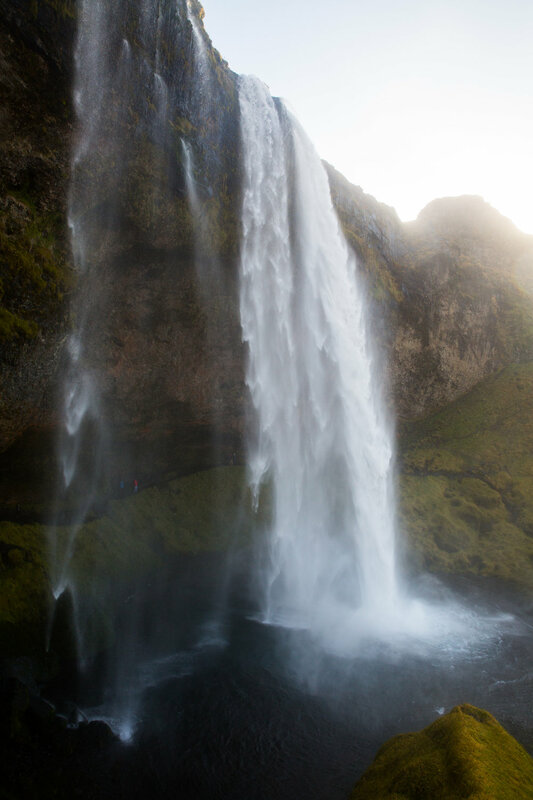 Seljalandsfoss is a 60 meter waterfall that is part of the Sejalands River. 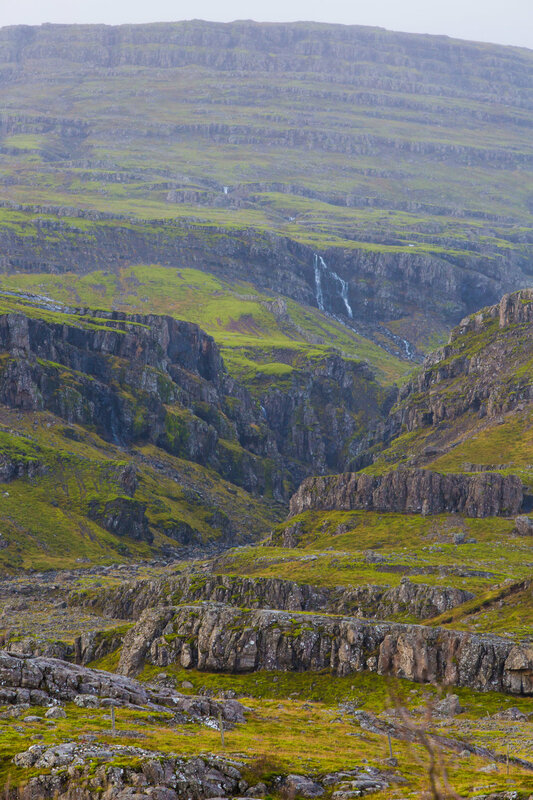 Born from the volcanic glacier Eyjafjalla, it's normally know as the waterfall that you can walk behind through a carved mountain wall. Easily a top pick from our adventure. Eyjafjalla from across the fields. 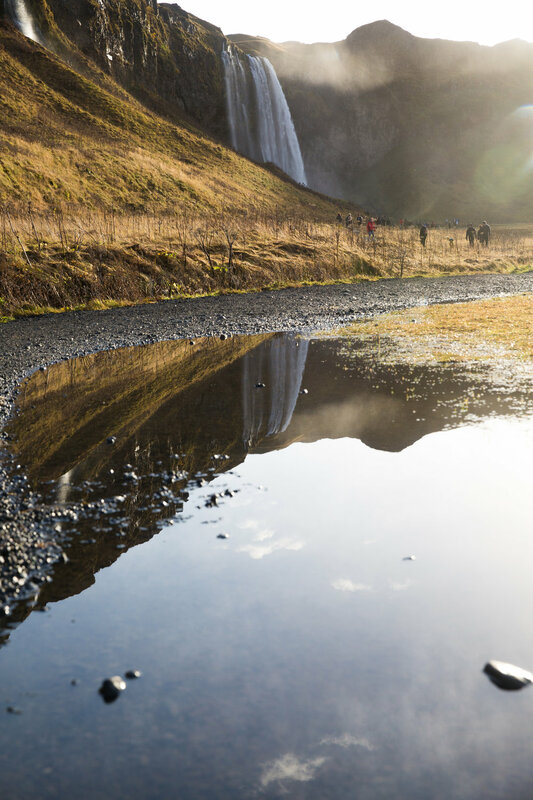 A unique feeling to Iceland: the sense of new adventure with nearly every view. 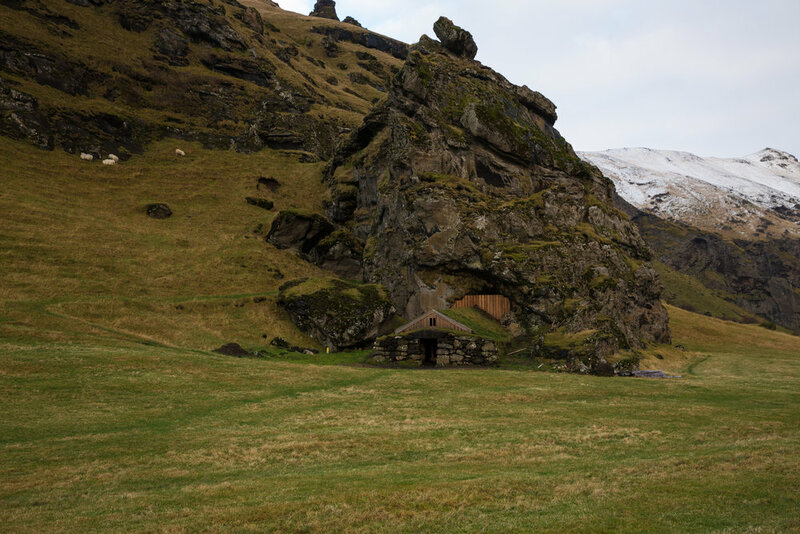 Icelandic turf houses are as beautiful as they are crucial for survival in Iceland's climate. 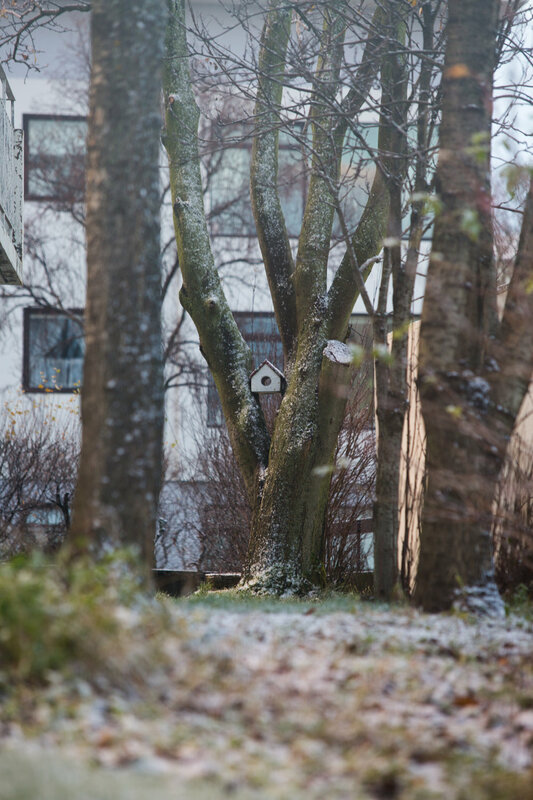 many Scandinavian buildings were traditionally made from Oak wood, but with scant resources during expansion (Birch wood was more common), using the landscape to your advantage became a regular occurrence. 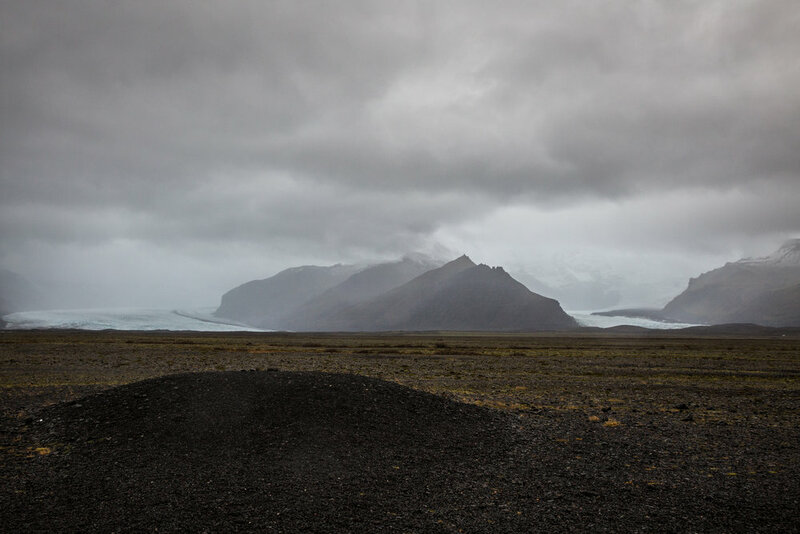 The small coastal town of Vik met us with heavy rain, the air smelling faintly of wet ash. Wind made salt crystals settle in any crevices not tightly wound in rain gear. The towers in the distance are named Reynisdrangar; formed of ancient basalt deposits in the area. Nordic folklore says two trolls tried to drag a ship to land one murky night, but were turned to stone when sunlight hit them, trapping them here indefinitely. The entirety of the beach is a fine black sand chilly paradise from the vast swathes of volcanic ash spilled at the edges of much the Icelandic coasts. 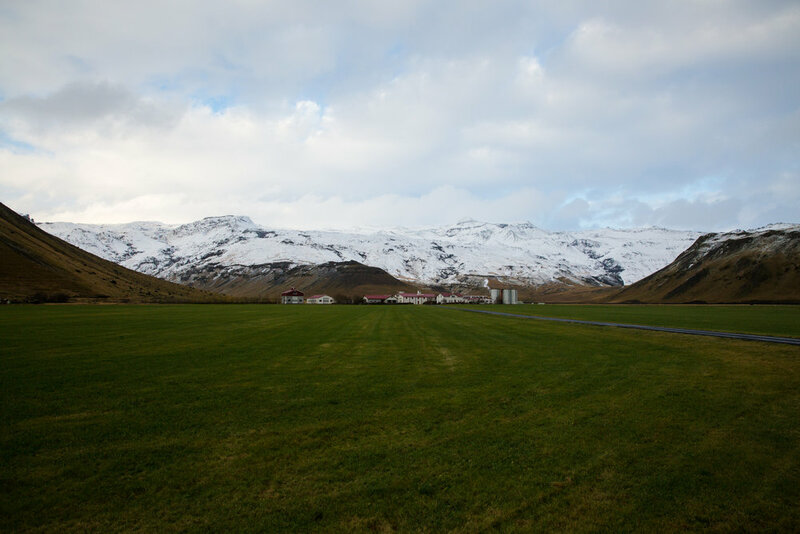 Not long after driving through VIk, we were met with a slithering view of Skeidarajokull. 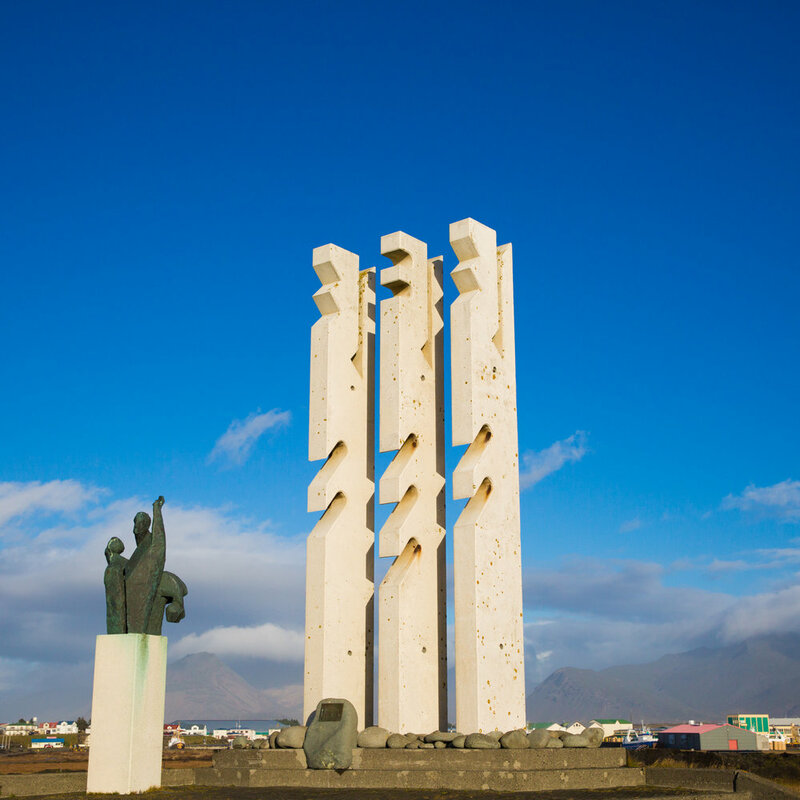 The metal is left over from Skeidara Bridge that was destroyed after the Vatnajokull volcano eruption in 1992. Flooding didn't do the bridge in, but the boulders the size of houses made quick work of the bridge. This monument was created in remembrance of how infrequently mother nature plays games. The ride off the Ring Road to Vatna Glacier immediately made me think of Ace Ventura 2's drive scene, the Rav 4 bouncing around every few seconds from tire-ending potholes. We pulled up to at what first feels like what a Klingon planet might convey; desolate, harsh, yet epic and full of honor. The rain wind whips you with a wide reach, echoing through the canyons with an eerie whistle. 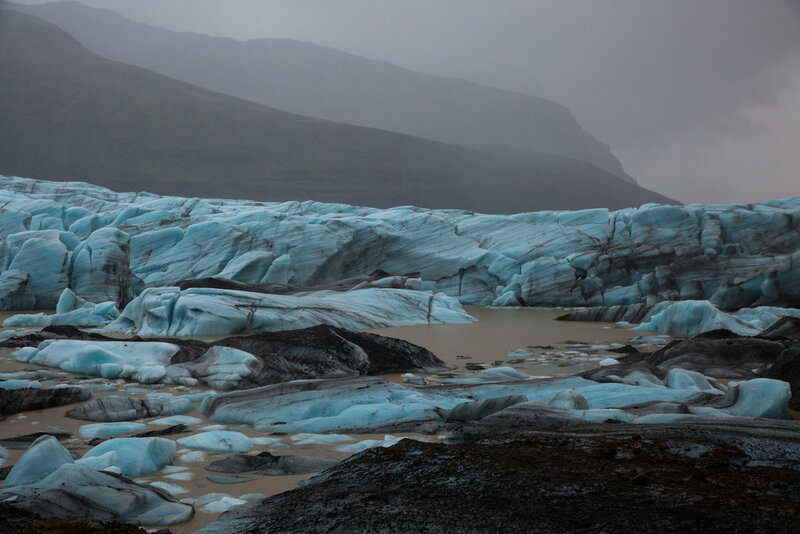 Glaciers turn blue due to their inability to scatter low-wavelength light of this hue in the spectrum. Combined with the volcanic ash-sand from the ancient living volcano, the color scheme here hit me as worth the price of the trip alone. Glacier cracks were starter guns sending off each visitor on their journey. After a salad and tunafisk sandwich with blue in view, we moved on. Driving through the night is almost impossible to avoid if you plan on stopping to see a majority of the sights on more than just a daytime pass, but it's dangerous. After a quick stop for groceries in Hofn, we made our way to a farm playing host to a dozen or so cottages with the above view to greet us in the morning. In a way, it was better that we missed the savagely gorgeous cliff sides we witness on the turn around trip back to the capitol. The winds were so offensive we had to move the car twice to have a safe angle to exit. If someone told me that a dragon turned these cliffs black, I'd believe it. Vesturnhorn Moutain stands proudly against the morning. This was the most beautiful example of paradoxical sight of volcanic rock covered in bright green moss that I'd seen and would see on our trip. How did it live in these chill winds? Hofn is a fishing village of roughly 2100 people. Above is the Seamen's Monument, to pay tribute to those lost at sea. Hofn is also home to the best langoustine I had while in Iceland. They even have a drive through window. A good time of the road trip, I was already thinking about what I would plan to do on my next trip here. There are several glacier tours that take you into the heart of a glacier, carried out on massive ice crawler vehicles. 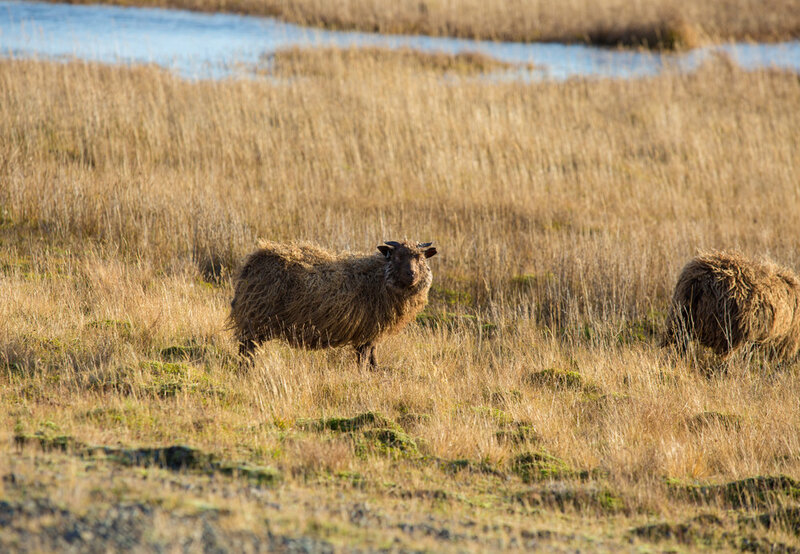 Roaming throughout the Icelandic grasslands are their prized sheep. WIth little to worry about besides a GPS locator on their ear, many roam all day and night as they wish. 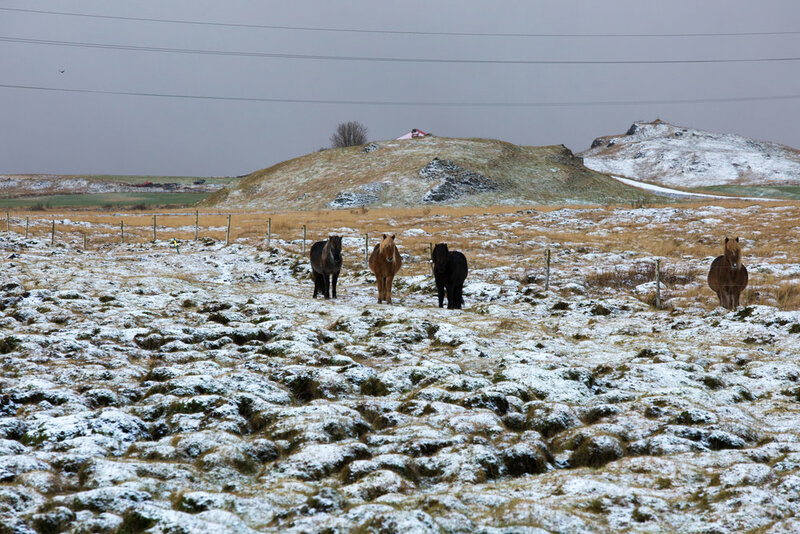 The history of the Icelandic horse goes back to the 9th century when Norse clans brought them over from the east. While small, they are known for their strength, resilience to cold and disease, with much praise also going to the two specialized gaits they have adapted over time. Riding these beasts is a different horseback experience than many back home may be used to. Another alien piece of landscape lies at Jokulsarlon, likely the most breathtaking glacier lagoon you can readily see in Iceland. Amphibious vehicles take visitors around the lagoon regularly, and hosts many movie sets further up the glacier, namely the fight scene between Ra's al Ghul and Bruce Wayne in Batman Begins. The rumor around here is that the graffiti on the bridge near Jokulsarlon was done by Banksy, but was in fact the art of Norwegian street artist Poble. My navigator on the treacherous roads of Iceland, and one of my closest friends from California, Jessica the Red. 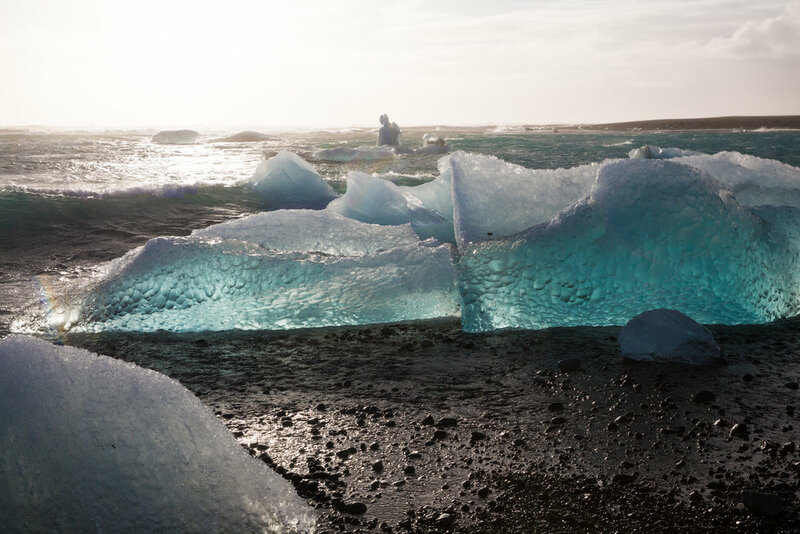 It's hard to explain the surreal feeling of watching pieces of glacier floating out to sea, and crashing on the waves of a black sand beach. Watching the blue bubbles frozen under the service look like something lives within. Science fiction lovers will be fascinated here. 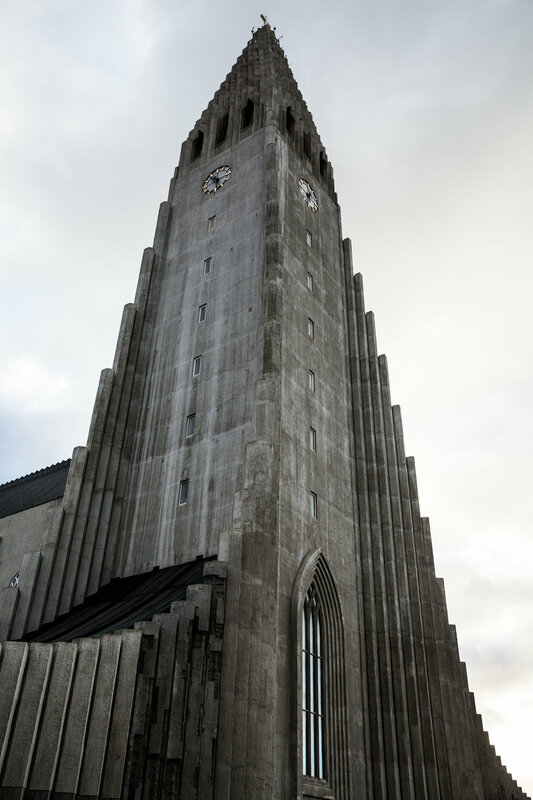 Halgrimskirkja, located in the center of Reykjavik, is a Lutheran parish church named after the poet and clergyman Hallgrimur Petursson. Commissioned in 1937 by State Architect Guðjón Samúelsson, is was inspired by the basalt lava flows throughout Iceland. Starting in 1945, the church was finally completed in 1986. German organ builder Johannes Klais of Bonn was choosen to bring his talents to Iceland. With 102 ranks, 72 stops, and 5275 pipes, it is 15 meters tall and weighs in at 25 tons. Construction of it was finished in 1992. The design and glass of the Harpa Concert and Conference Hall was designed by Danish-Icelandic artist Olafur Eliasson, in tandem with Danish firm Henning Larsen Architects. Before the Icelandic crisis in 2008, it was meant to be part of an area to dubbed the World Trade Center of Iceland. While is stands a beauty, you can no see construction slow starting to resume in the deep pits near the structure. I had to experience the glory of the original Bæjarins Beztu Pylsur hotdog stand, located in Tryggvagata, Reykjavik. The godsends are made primariliy of lamb, with a beef and pork mixture. The stand has been in continuous operation since 1937. Visited by the likes of Metallica's James Hetfield, President Bill Clinton, it showed up on my radar first in Anthony Bourdain's No Reservations. The setup: ketchup, sweet mustard, remoulade, crisp fried onions and raw onion. Street food is a must for me in any foreign country. 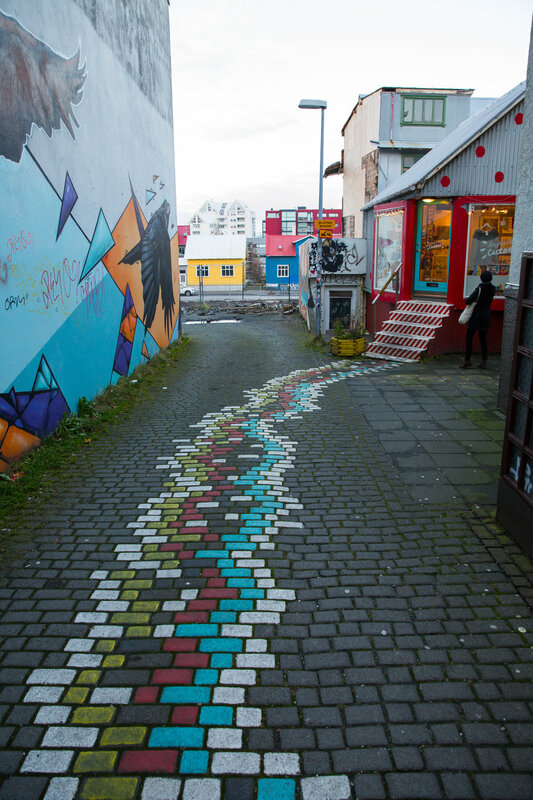 In many ways, the streets and environs of Reykjavik make for a perfect canvas for the bright street art that covers many parts of the city. Night coming on quickly on the streets of Reykjavik. Banners to the Icelandic people wave freely throughout the streets. 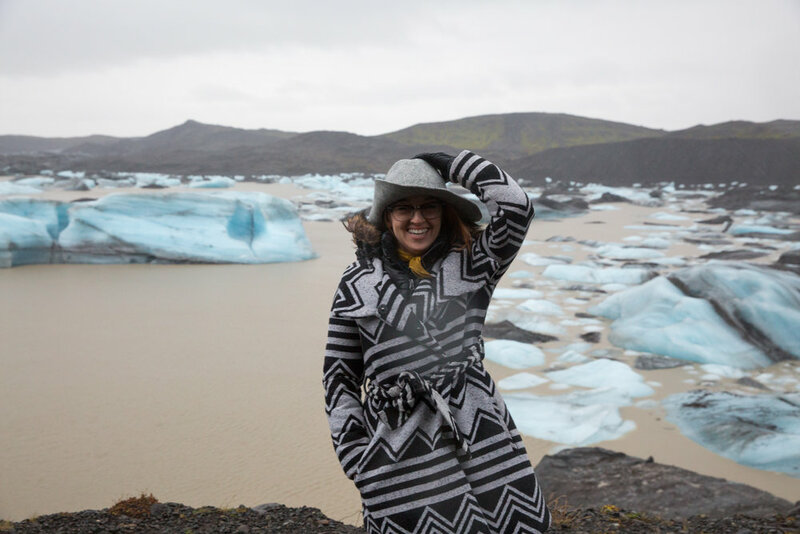 I really loved spending time in Iceland, and look forward to returning there. The question I often get is how the people are there. I'll say this, for an island nation that pretty much didn't exist to all of you before the volcano eruption in 2010, and has a population of less than 350,000 people who stem from the Vikings, they are very hospitable. Also take into account that their Prime Minister recently resigned after being caught up in a scandal after revelations in the Panama Papers. There was an emergency election the week we were there, with some of the biggest protests in a country more than a millenia old. Fight is very strong in the island's people. I enjoyed talking to an AirBNB host known as Snow Bear, whose farm we stayed on during the first few days in the country, mainly because of how blunt his attitude was. Every Icelander has an epic story or family history that they speak proudly of; something I wish I saw more of in everyone. Thank you to the people of Iceland for allowing us to tour your beautiful country. Next time, we fly, scuba dive and snowmobile in the north to our hearts content. Below is a gallery of my favorite selections on the journey. Feel free to ask any questions about the trip below or in my contact section.